On my way to visit USS Belleau Wood near Australia, I spent a night in Cairns, Queensland. Well-known as an entrance to the Great Barrier Reef, the town seemed to exist only for tourism and diving. A Marine Corps helicopter came to the Cairns airport to exchange passengers and pick up cargo. Australia's extremely strict environmental laws required the crew to spray two cans of bug spray inside the helicopter before opening any doors, and then hand the empty cans to the agricultural inspectors on the ground--even though the CH-46E is open in the rear and on the upper sides. When I boarded, I pulled on a life vest and cranial helmet before fastening my seat belt. A crewmember plugged a radio cord into my headset so I could talk to the pilots. The noise was too great to talk to the other passengers. With the vibrations and the wind blowing through, our short ride was long enough. We flew over the Great Barrier Reef on our way to the Belleau Wood, 35 miles off the east coast of Australia. 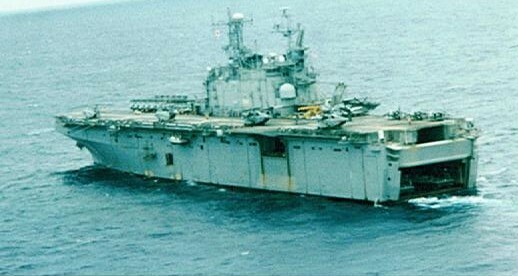 USS Belleau Wood (LHA-3) is a landing helicopter assault ship, designed to be both a helicopter carrier and an amphibious dockship. It was commissioned in 1978, the same year I became a maintenance officer. It operates five Harrier jump jets and 25 helicopters, as well as carrying several decks full of trucks, tanks and other wheeled vehicles. The ship has 900 permanent Navy personnel and 2000 embarked Marines. Other ships in the amphibious ready group carry the remaining Marines and equipment of the 31st MEU (Marine Expeditionary Unit). The Belleau Wood is named for the World War I battle where Marines suffered 55 percent casualties to acquire a small woodland in France. The defeated Germans later referred to them as Teufelhunde (devil dogs) for their fierceness in battle. The official nickname of LHA-3 is "Devil Dogs," and that is what today's Marines call themselves. During my visit, I walked through all the aircraft maintenance spaces on the ship and talked to Marines and Sailors who worked in them. I also toured the hospital and engineering spaces. The hospital on this class of ship is larger than on any other Navy ship except for hospital ships; it has four operating rooms. The ship is designed so that the Marines' berthing area becomes part of the hospital after the battalion goes ashore. This dual-purpose configuration brought home to me the horrors of war, knowing that all those young men lived with the possibility of getting shot up and coming back as casualties. The complexity of the engineering spaces amazed me, and I only saw a small portion of the operation of this steam-powered ship. In an awe-inspiring balancing act, Sailors monitored temperature, pressure and quantity gauges for two boilers and a maze of lines carrying steam, hot and cold water and oil. I admired those individuals working in such adverse conditions of extreme heat and noise. Realizing the system was designed to take bomb damage and continue to operate the ship made it even more overwhelming. My most memorable moment was watching a Harrier land on the flight deck. I've seen numerous jets land on aircraft carriers--they come screaming in from the rear at full speed, land with a thud, and get jerked to a halt when the aircraft tailhook catches the ship's arresting gear. The short-takeoff-and-landing Harrier also approaches from the rear, but instead of slamming onto the deck, it stops in the air alongside the ship, then slides over and sets itself down. Most flight operations take place at night because the aircrews fly with night vision goggles. This requires the ship to be dark. Marines working on aircraft on the flight deck were restricted to using flashlights with blue lenses. Those in the hangar bay worked under dim yellow lights high in the overhead. What impressed me throughout my visit was how cheerful and dedicated everyone seemed to be, in spite of cramped and difficult working conditions. Because the Belleau Wood is forward-deployed, it doesn't have the workup and deployment cycles of other ships. It is expected always to be ready. When the Belleau Wood pulled into Gladstone for fuel, I walked off after the quarantine inspection had been completed. There was no liberty because the ship was getting underway the next morning to conduct an exercise. From my hotel room I could see the silent Belleau Wood in the harbor half a mile away. Knowing it contained 3000 people made Saturday evening a rather lonely experience for me. I can best describe the feeling as that of a child whose friends can't come out to play. I called the one Lutheran church listed in the telephone book and the minister answered. He offered to give me a ride to church the next morning. After the church service, a woman took me to her house, fed me lunch and gave me a tour of the surrounding countryside before returning me to my hotel. I flew to Brisbane the next morning for a nine-hour nonstop flight back to Japan.